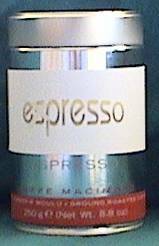 Is it expresso as in your title or espresso as in the label on your jar/tin? Hope it goes really well and you truely meet with God. Hope it goes well Steve. We haven’t really decided whether it is Expresso, Espresso, or Exspresso. I prefer the last one. Anyway… Exspresso was interesting lastnight. I spent the whole time feeling crappy and came away feeling good, in the end. Interesting that. Next week should be good. I like “espresso” (cos it shows we’re hip and know that it is espresso, not expresso (the coffee that is)). Also i wonder if expresso will come later, as espresso gets involved in some missional eXpression. And the espresso in the logo has a cross through it, which makes it look a little x-ey. Ah, but Exspresso shows that it’s not just coffee… it’s expressing ourselves over espresso, hence Ex-spresso… how about that? Or, E+spresso, or E*spresso..? We could call the missional activities Expresso, that’s a good idea. if presso is italian for ‘near’ would that make ‘ex-presso’ mean ‘formerly near’? Sort of the opposite of ‘once you were far-off but now you are near. . .’ Or is etymologically akin to ‘beano’ [either a) a comic read by Eric Clapton on an early blues album or b) a substance that controls intestinal gas]?